Sports Illustrated’s @si_vault Twitter account is something like a phenomenon and a must-follow for any discerning fan on Twitter. Thankfully, it declared yesterday “Washington DC Day” and unloaded 20 or so great photos of D.C. sports subjects. Here are my five favorite, and by favorite I mean I’d never seen them before yet love them so. The Sean Taylor photo was easily the best one. Silly not to be on this list. 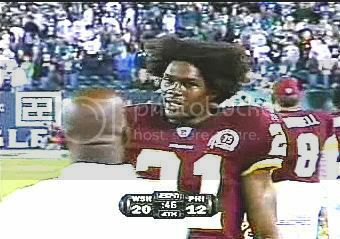 I love Sean Taylor as much as the next Skins fan, but that was just an ordinary Sean Taylor pic. …and a very common Sean Taylor pic at that. That Taylor pic is at Lincoln Financial (Philly), not FedEx as the tweet says. Notable that he was giving love to the B&G fans who braved that wretched hell hole. The best one is Thomson, Ewing, and Regan. I’d put in the hogs in top hats over the Monk pic. Honorable mention to Manute Bol lifting weights!